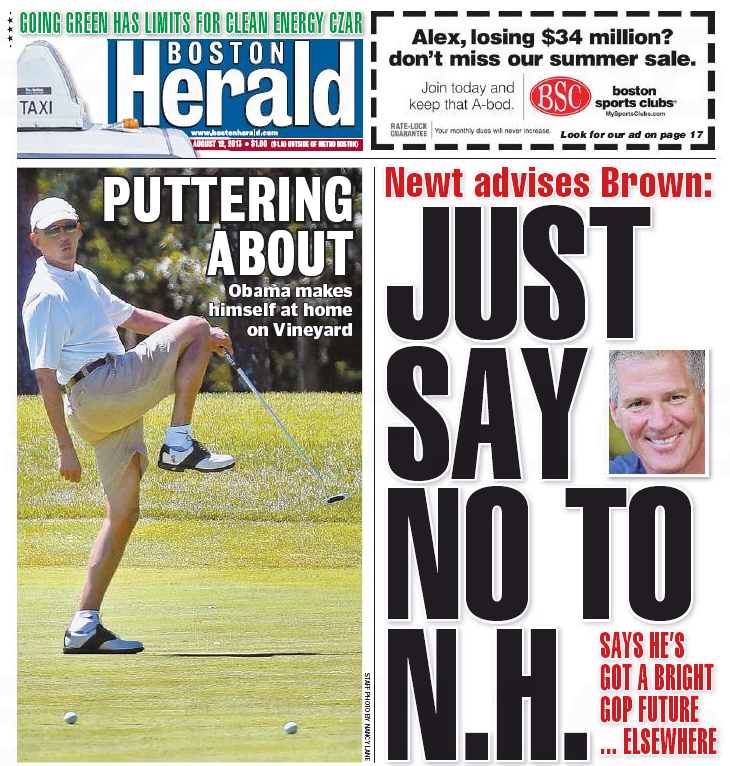 Man, is the Boston Herald grumpy today. 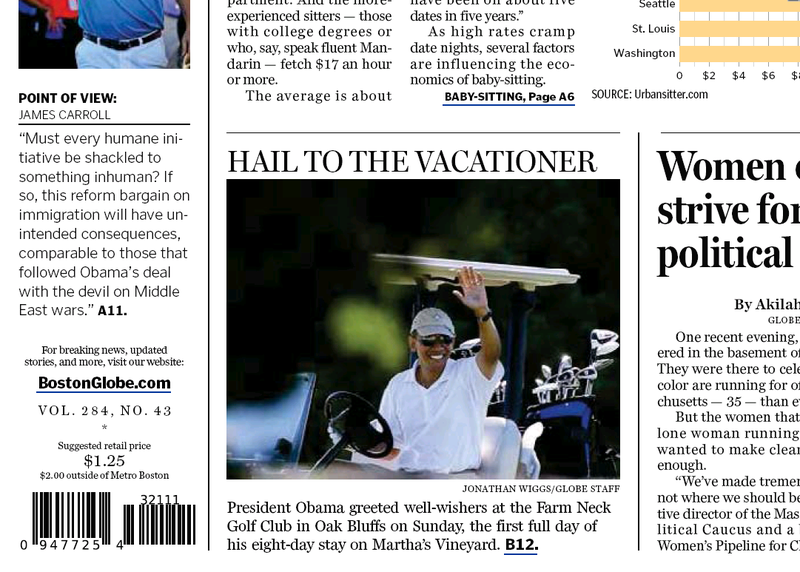 And the object of its grumpitude is the Golfer in Chief, who gets half of Page One for starters. Then there’s a full page of kvetching about Pres. Obama’s vacationing ways inside. “Is Obama auditioning for the Ginyu Force with that picture?” tweeted @mininerd_julia. 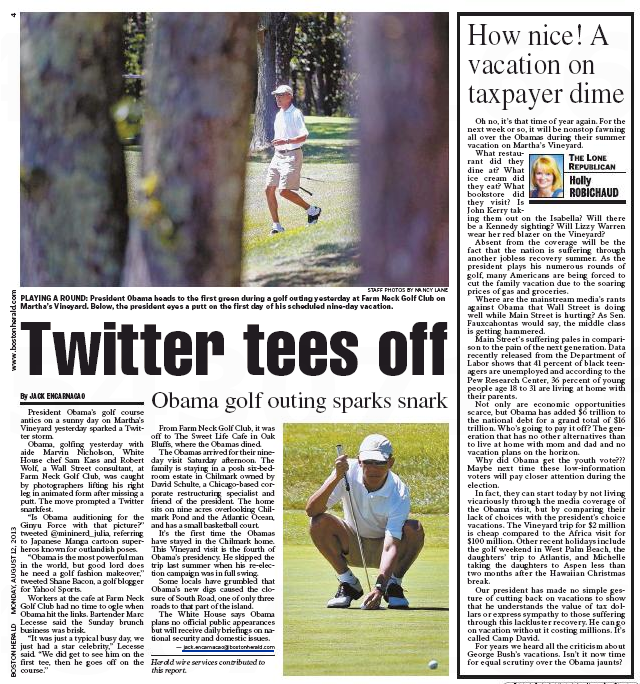 “Obama is the most powerful man in the world, but good lord does he need a golf fashion makeover,” tweeted Shane Bacon, a golf blogger for Yahoo! Sports. Oh no, it’s that time of year again. 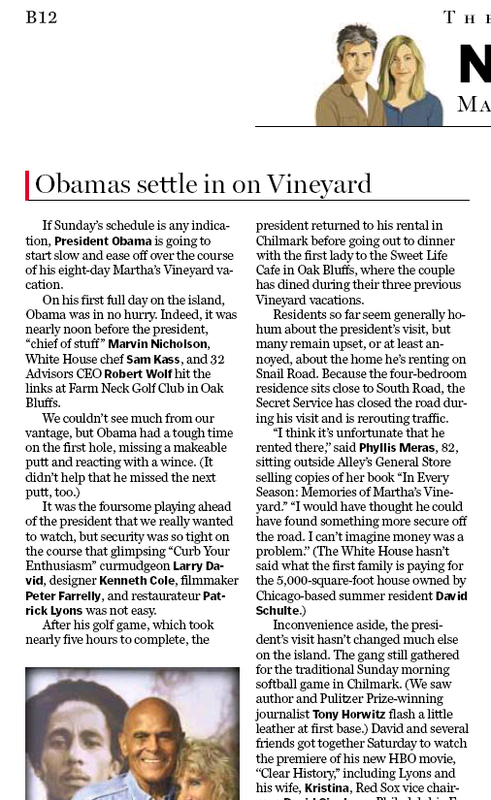 For the next week or so, it will be nonstop fawning all over the Obamas during their summer vacation on Martha’s Vineyard. What restaurant did they dine at? What ice cream did they eat? What bookstore did they visit? Is John Kerry taking them out on the Isabella? Will there be a Kennedy sighting? Will Lizzy Warren wear her red blazer on the Vineyard? Absent from the coverage will be the fact that the nation is suffering through another jobless recovery summer . . .
We can’t remember if Robichaud wrote the same kind of column when George W. Bush went on vacation. We’d check if it weren’t so hot. Then deliver the big wet kiss in the Names column. Over the weekend, Belafonte, 86, and his wife, Pam, stopped into Peter andRonni Simon’s Vineyard Haven gallery, and checked out Peter Simon’s portraits of reggae legend Bob Marley, who was a friend of Belafonte’s back in the day. On a personal note, the hardworking staff has a golfing dream of its own: to someday shoot our IQ. If and when it happens, you will assuredly hear about it. That’s the new unreality show that debuts tonight on ABC Family. ABC Family’s newest original docu-series, The Vineyard , is set against the idyllic backdrop of Martha’s Vineyard, MA, and features the island’s iconic Black Dog Tavern. 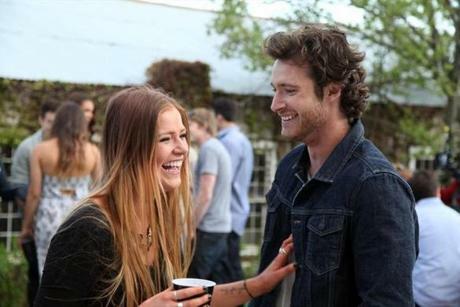 The series follows a mix of locals and transplants living and playing together for the summer. Rounding out the cast of seven girls and four guys is a Latin pop princess, a hopeless romantic and a pre-med student, just to name a few. It’s sure to be an intriguing combination of new friends, new rivals and tight quarters, all resulting in a summer of trouble and romance. Except . . here’s what the TV critics at the local dailies say about it. Both shows feature people in a tight geographical area. One features people behaving unspeakably stupidly and vile, the other is based on a Stephen King novel. Shouldn’t that be “vilely”? Funny you ask – the Boston Globe’s Matthew Gilbert says, not really. On some reality shows, the characters seem partly real and partly the creations of the director; on “The Vineyard,” the characters seem almost entirely designed by the director, as if the cast members have been given extremely precise instructions. Katie and the oh-so-chivalrous and ab-tastic Lou are going to be the romantically tortured “A” story. OK, I have to be transparent. I just went to Thesaurus.com and searched for “repulsive,” and right now I’m feeling overwhelmed by the number of appropriate choices I have to round out my final thoughts on “The Vineyard.” “Odious” is good, but maybe a little too sniffy; there’s no point in being sniffy about a show so obviously rigged to be vapid. “Vile,” too, is an overreaction. I mean, these people are so flat and unreal, it’s pointless to waste sharp words on them. Ah well, even “repulsive” won’t do. I’ll stick with “hollow” and “generic” and get out. Of course you’re wondering: Will the hardreading staff be watching tonight’s premiere?